Athletes like to win. No ifs, ands, or buts. They look for every tiny advantage they can to dominate the competition and ensure they’re one step ahead of the game. A big part of that involves taking care of your joints and making sure that your mobility leagues beyond your peers. In the vast majority of sports, the hips take an absolutely brutal beating. Football, hockey, MMA, even tennis. Even in the non-athletic population, the hips are often the culprit behind common ailments such as knee pain and back pain. When you have hips that function like the tin man, it’s not only your performance at a given sport that’s going to suffer – it’s your quality of life. Thankfully, the advent of foam rollers and other DIY soft tissue techniques have enabled us to keep our hips in top-notch shape. Here are just a few of them that you can use to stay at the top – athlete or not. The glutes are the epicentre of the hips. If these aren’t firing correctly – or they’re knotted up – you’re going to be experiencing some incredibly annoying back and knee pain. And we don’t want that. Thankfully, this release is incredibly straightforward. Just sit on your foam roller and roll diagonally on your glute muscles. To increase intensity, take the same leg as the glute and cross it over your free leg at a 90-degree angle. Also, don’t forget to hit the side of the hip – the glute medius. This oft-forgotten muscle is vital to overall hip stability and can wreak havoc on your lower body mechanics if it’s weak and knotted up. Just roll over on your side and go to town. But remember – don’t just roll back and forth. Find a sticky spot and stay on it – no matter how bad it hurts. Alternatively, you can use a lacrosse or tennis ball on this area if you find the foam roller too cumbersome to maneuver. The quads take a lot of abuse in athletes – especially since a lot of them tend to be quad dominant instead of hip dominant, which we don’t want. To counteract this, we have to release the quadriceps and retrain the glutes and hamstrings to power our lower body. Releasing the quads is simple. 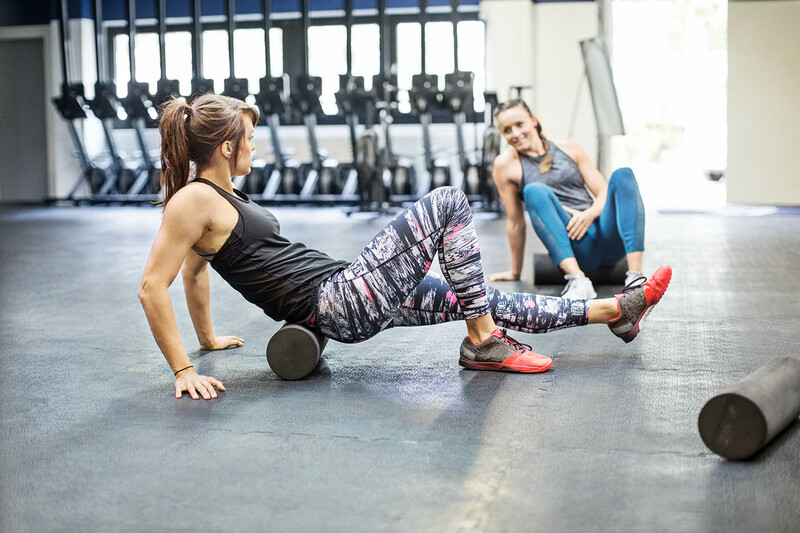 Flip onto your stomach and drape a leg over your foam roller. Only one at a time – if you put both legs on the roller, you won’t be able to generate the force needed to release the tissue. The same rule applies here – don’t roll super-fast. Find a spot and stay on it until you feel changes in tissue quality. Don’t roll in an up-and-down motion. If you do that, you’re just rolling with the grain of the muscle fibres and doing nothing to fix your quads. Instead, rock side-to-side. Think about “sawing” the muscle off the bone. A ghastly thought – but it’s the most effective way to dislodge all the tissue. Be sure to hit all three parts of the quad as well. The middle quad, inner quad, and outer quad. Do yourself a favour and avoid rolling the IT band. You can’t release it anyway. Hamstrings are somewhat of an afterthought for most of us. We think that a few seconds of bending over and touching the floor is enough to keep our hamstrings supple. But that’s far from the truth. In athletes and the general population alike, the hamstrings end up being monstrously tight and knotted – and therefore in dire need of some loving via foam roller. The same concept applies here as it to did to the quads and glutes. Don’t roll up and down. Stick with side-to-side. Find the sticky spot and work on it. Rolling fast does you no good. Work on it until you feel changes in tissue quality – which is about 2 minutes for most people. And while you’re teaching your lower hamstring whose boss, be sure to hit your adductors as well. These run along the inner thigh and tend to get tight on most people, which causes the knees to cave in when we do basic activities such as walking. Forget about heavy squats if you have tight adductors. So smash ‘em up while you’re down there. Try out these tissue releases and watch your overall hip mobility go through the roof. And say goodbye to some of that funky knee and back pain as well.